“The National Mediation Awards are now into their third year. Past winners have included Lloyds Bank, Marks and Spencer and DHL amongst many others. The 2014 awards promise to be our biggest and best yet. We are thrilled to welcome Michael Gibbons back as one of our judges and are already receiving numerous applications for each award category. The Professional Mediators’ Association is hosting the eagerly anticipated 2014 National Mediation Awards in conjunction with Executive Grapevine. The annual awards ceremony, first launched in 2012, makes a triumphant return to the UK mediation scene to celebrate excellence in workplace and business mediation. The event encourages key players in dispute resolution to showcase industry trends, promote outstanding business/individual achievements in mediation and trade success stories in an ambient environment. This year’s ceremony will be held in central London on Thursday 25th September 2014 from 12.30-17.00 the precise location will be confirmed soon to attendees. The PMA will open the event with an Annual General Meeting (AGM) between members and the PMA board. This will be followed by a conference featuring talks from various thought leaders in mediation. 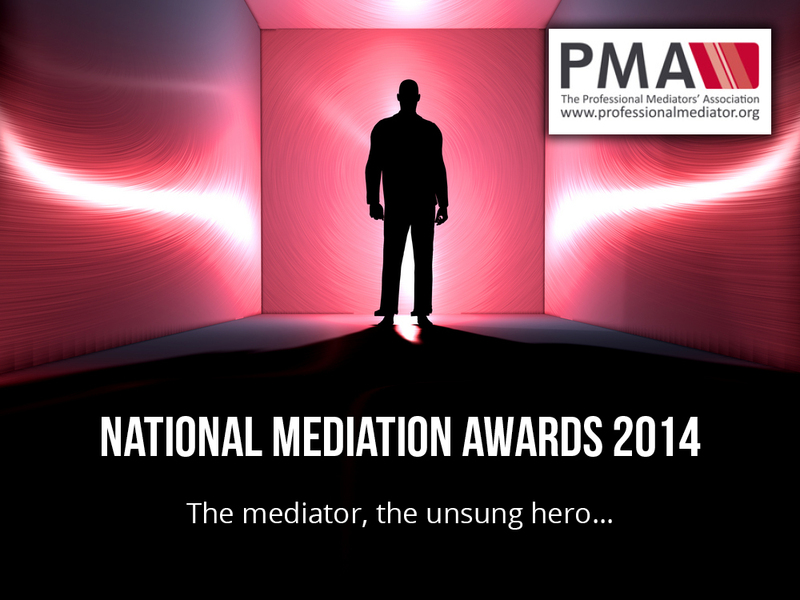 Nominees will be presented with their awards by a judging panel of esteemed mediation experts headed by Michael Gibbons - author of the infamous Gibbons Review (Better Dispute Resolution).Winners of the PMA Article and Video competition will also be announced on the day. This ceremony is strictly invite only, please RSVP to be added to the guest list. The categories for nominations are still open for submissions here. To book a place for the event, email admin @professionalmediators.org. The event is free for PMA members with a £25 charge for non-members to gain entry to the conference and subsequent awards ceremony. Guests will be treated to examples of best practice in the professional use of mediation, emerging trends, as identified by the speakers, and most importantly, they will have a rare opportunity to network with high achievers in mediation against a collegial atmosphere. The PMA is a non-profit membership body for business, employment and work place mediators. We provide a quality assurance framework and opportunities for professional development to all parties involved in mediation within the workplace and business. Please call (0207 092 8840) or email Mercedes Brown via Mercedes.Brown@professionalmediator.org for more information on the event. * For more information regarding media usage, ownership and rights please contact Professional Mediators' Association.